With the 2014 season in the rear-view, let's look back at how the Cowboys did on a position-by-position basis. We'll look at starters and contributors, not every last man on the roster. If there was one place you felt good about — other than the offensive skill — on the Cowboys heading into the 2014 season, it was their special teams stars. And as expected, the unit performed at a pretty high level in 2014. 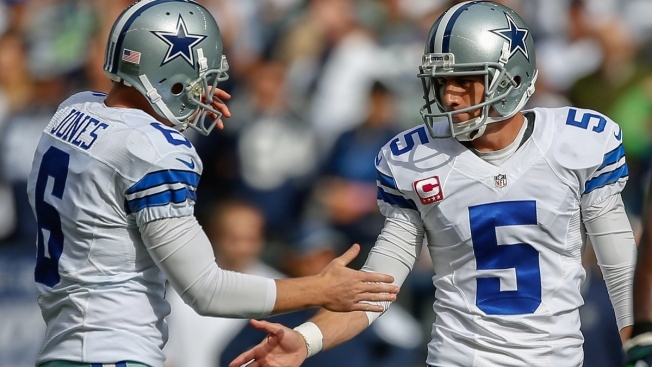 Where do you begin with Dan Bailey? He became the NFL's all-time most accurate kicker this season by going 25-for-29 on his attempts while missing just two attempts of less than 50 yards. But he played a small part in the grade being knocked down below an A by missing two huge field goals in the postseason. Punter Chris Jones didn't have a very good average (just shy of 40 yards), but he did have 21 punts downed inside the 20-yard line. Special teams star Dwayne Harris led the team in special teams tackles, which isn't a surprise, but his return game wasn't as electrifying as it's been in the past. Michael Irvin: "You Have to Hand That Ball to Marshawn Lynch"